The obsession with yoghurt continues – this time using it to fashion a traditional Middle Eastern-style cheese called Labne. 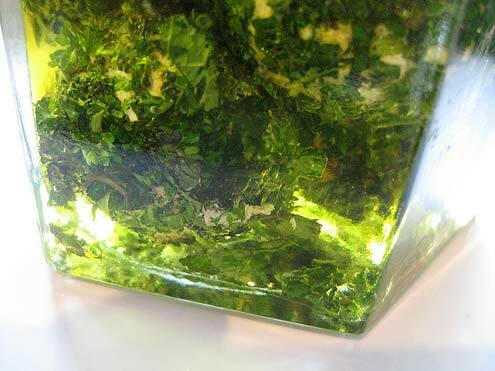 Once made it is rolled into small balls, coated with fresh herbs, placed in a jar and covered with olive oil. Simple and delicious. Line a sieve with a tea-towel or muslin (£2.50 a metre from John Lewis) and place over a bowl. Mix together the yoghurt and salt and spoon into the tea-towel or muslin (£2.50 a metre from John Lewis). 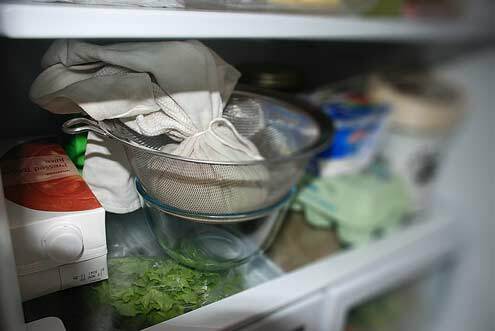 Tie the tea-towel or muslin (£2.50 a metre from John Lewis) to tightly contain the yoghurt and place in the fridge to drain for 24 hours. 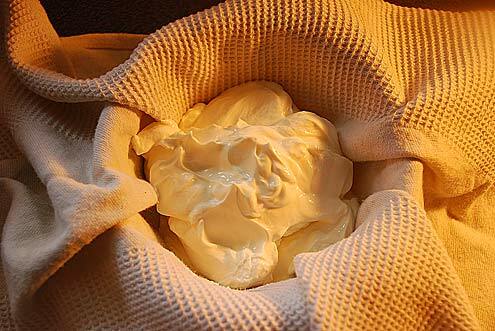 It’s a good idea to occasionally squeeze and twist the yoghurt bundle to speed up the draining process. After a day you should have a thick, creamy cheese which can either be eaten as it is or embellished with various herbs and flavourings. 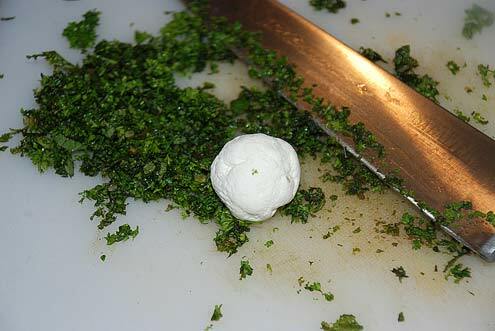 We opted to divide it into small balls and roll them in fresh chopped herbs – parsley, coriander, basil, possibly a little lemon zest. Carefully place in a sterilised jar, cover with olive oil and store in the fridge. They should last up to a week. Verdict: Excellent. 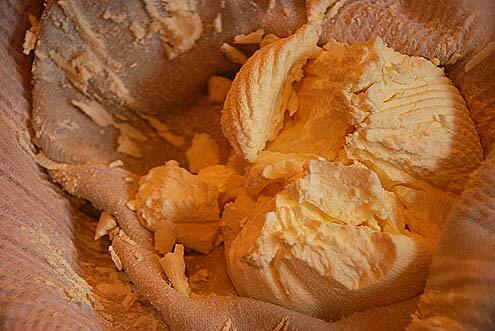 Very similar to Philadelphia cream cheese – but much better. Experiment with different flavourings such as garlic, olive or sun-dried tomatoes. Give a jar to a friend or relative, step back and absorb the praise. Entertainment: A viewing of ‘In the Loop’, led to the immediate purchase of the first series of ‘The Thick of It’. It’s like you said, that it’s similar to Philly cream cheese, only better. You may not serve Philly at an elegant brunch, but you sure can serve this. Thanks for sharing. Do you work for John Lewis or something? I also bought a special yogurt making thing and I really like it. No fussing with sieves, big bowls and cheese cloths.